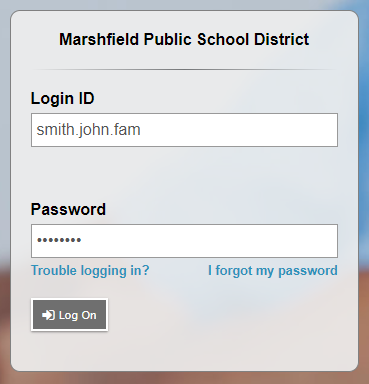 Marshfield High School Athletics will be using ASPEN to register for Athletics. ​ Registration will open November 1st. Please log in to your Family Portal account at https://aspen.mpsd.org. Students cannot register through their Student Portal accounts. As a reminder, Family Portal login IDs are in the following format: lastname.firstname.fam (for example, smith.john.fam). If you are unable to access the portal, please contact aspen@mpsd.org for assistance. You will need to have the “Tasks Widget” enabled on the Aspen home page in order to complete the registration process (called a “workflow” in Aspen). 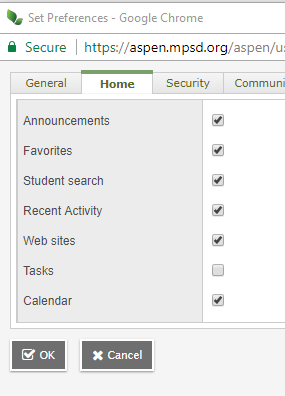 If you already see a “Tasks” section in the lower left section of your Aspen home page, you can skip the info in the box below. In the upper right corner of the screen, click your name and then click Set Preferences. In the window that pops up, click the “Home” Tab and be sure the Checkbox next to “Tasks” is checked and click “OK”. In the window that pops up, click the dropdown next to “Workflow” and choose ‘MHS Athletic Registration” for the appropriate season. Once you have selected ‘MHS Athletic Registration”, click the Magnifying Glass next to “Student” to select the Student you wish to register. (Please note that the magnifying glass will not appear until you have selected the appropriate workflow.) Select the Radio Button next to your Student and click “OK”. After choosing your Student, click the “Next” button at the bottom of the pop-up window. Note: If you have multiple students connected to your Family account, they will all appear in the selection list. You will complete the workflow for each student individually. When the form appears, you may need to scroll up if you are not already at the top of the form. Make sure the name of the student that you are registering is at the top of the form. If you have selected the wrong student, do not click the back button, click “Cancel” and start again. Please read through all the information on the registration form page and answer all questions, using the scroll bar on the right to move up and down the page. Most questions are yes or no answers (checkboxes), and some are boxes where you may need to fill in information. All students must pass a physical examination prior to participation in High School Athletics. A physical exam covers the student for 13 months from the exam date. A student's eligibility will terminate once a physical has reached the 13 month limit. This is keeping with MIAA policy. Physical examinations must be performed by a duly registered Licensed Physician, Physician's Assistant or Nurse Practitioner. Please fill in the 'Physical Date' Field below with the date of the student’s most recent physical or upcoming scheduled physical that meets the requirements for the whole season. Please send a copy of the physical to the attention of the Athletics Office, or email a copy to smadden@mpsd.org. The application will not be complete without a copy of the physical submitted. Your student will not be able to participate in tryouts or practices until the physical is received. Online Payment – The fee can be paid online via UniPay Gold (the link is in the workflow, or you can find it online at mpsd.org). If you choose this option, please make note of the online payment confirmation number and include it in the appropriate box on the registration form. Check or Cash – The fee can be mailed or dropped off at the High School. Please make the checks out to The Town of Marshfield. Waiver Requests – If you are requesting a waiver, you must complete and submit a Free and Reduced Lunch Application, which can be found on the Marshfield Schools Food Service Page,. This link is also in the workflow, or can be found at www.mpsd.org. Family Cap – Marshfield has a $600 Cap per Family per School Year. If you have reached this amount for this school year, please choose Family Cap as your payment method. Previously Paid - If you have previously paid the Athletic Fee for this student this year, please choose Previously Paid. After all questions are answered, BOTH the parent and the student must electronically sign the document, then click the “Next” button in the lower left corner. The very last step is to submit the form. To do this, you must select the “Finish” button in the lower right corner. If you close this box without clicking “Finish”, you will NOT be registered for Athletics. To confirm that the registration completed successfully, you may choose “Closed Tasks” in the Tasks Widget on your Aspen home page where you will see a list of registrations received and the corresponding dates. If you have additional athletes to register this season, you may initiate and complete another workflow for each additional student.